This article is a short summary of Mario Party: Star Rush. 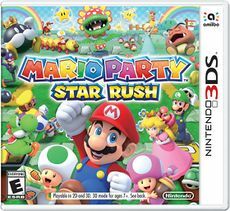 Mario Party: Star Rush is a Nintendo 3DS installment in the Mario Party series, releasing in most regions in October 2016 and in North America in November 2016. Recruit characters like Toadette, Rosalina, and Wario to team up with and support you in Toad Scramble starring Toads. Choose from multiple boards in different worlds, each with tricky boss battles. Up to four players can simultaneously roll and move freely around a map. Team up with up to four Mushroom Kingdom characters who can help you win by participating in different events. Fully refined for bite-sized portable play, perfect for the Nintendo 3DS family of systems. Multiplayer via Local Wireless (additional games and systems required; sold separately) or Download Play (additional systems required; sold separately). For the first time in series history, compatible with multi-card communication. Packed with different modes that everyone can enjoy. This page was last edited on 22 January 2017, at 21:20.